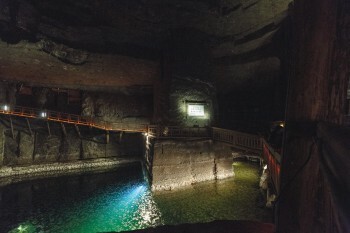 The most popular way, the tourist route is about 3 km of winding corridors located between 135 and 240 meters underground. 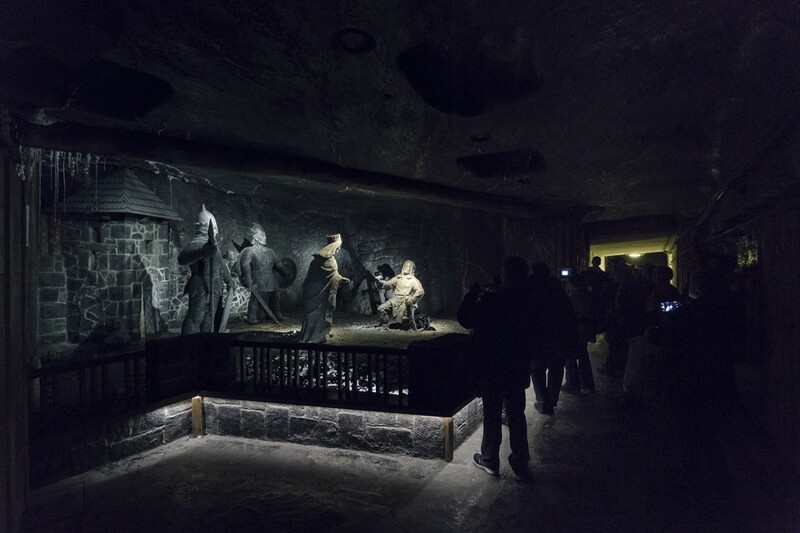 The tour lasts about three hours, in groups of up to 40 people and starts in the Daniłowicz Shaft, where the guide will introduce you to the history and secrets of the mine. 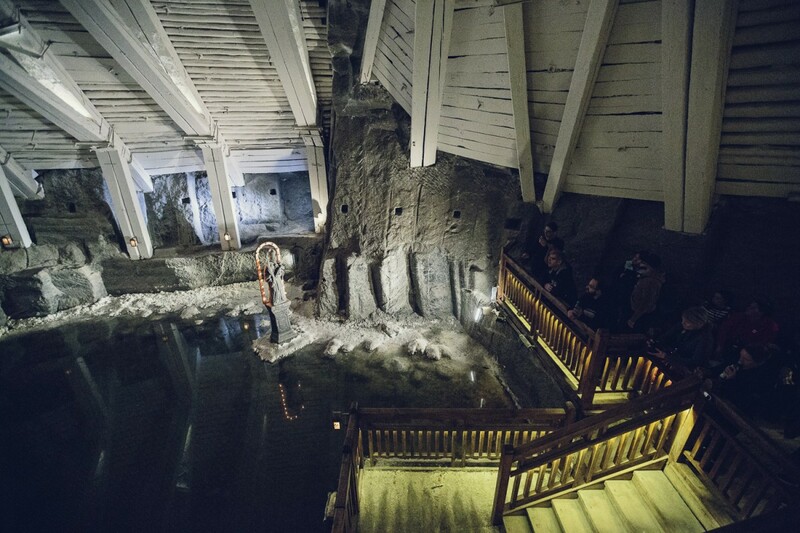 The trail leads to the Chapel of St. Kinga, where you can see salt works of art or a spectacle on a salt lake. It is worth knowing that there are approximately 800 stairs on the route, of which 380 are already at the beginning, which is why we suggest you put on comfortable footwear. The temperature below the ground varies between 14-16 C.
The trip along with travel times takes about 4 hours. We can pick you up from one of the six points specified on the map (map available below the description and in the link http://tinyurl.com/yachy3bb). Getting to the Museum from Krakow takes about half an hour. The tour takes place in groups of 40 people. The guided visit takes about two and a half hours. This option is most often chosen by visitors. The price includes pickup from your accommodation or one of the fixed meeting points, as well as an admission ticket, a tour with a professional guide in one of the available languages (Polish, English, French, German, Russian, Italian or Spanish) a drink and transport back to Krakow. This option is available during the winter season (November-March, 2019) on chosen weekdays. During the summer season (April-October, 2019) this option is available every day with different languages on specific days. 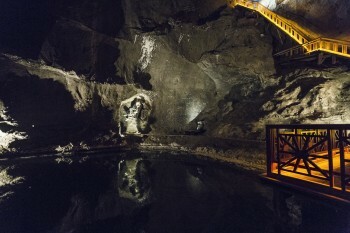 The Custom Made option allows you to maintain influence over the duration of the trip (please keep in mind that in the middle of exploring the mine it is not possible to leave earlier). There is, however, the possibility of staying underground longer to visit the additional parts of the mine, for example, the Krakow Salt Works Museum. You can also take the underground railway rail ride available daily at 12:00 14:00 and 16:00 during the whole week. Tickets for adults (PLN 9) and students/children (PLN 6) are available for purchase in the Staszica chamber. Near the entrance to the Mine, there is a graduation tower where you can also spend some extra time. A visit to the graduation tower is one of the most pleasant varieties of inhalation therapy. The natural salt aerosol formed in the graduation tower is not much different from the one above the sea. The air inside the graduation tower supports the treatment of selected respiratory diseases and also has a positive effect on everyday well-being. A modern vehicle with a high-quality trim will make the ride even more enjoyable. 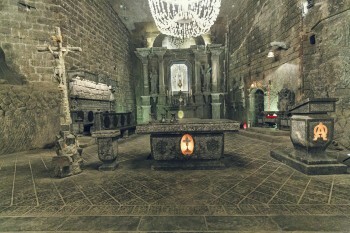 After the tour, our driver will take you to your chosen destination in Krakow. Be it a unique restaurant where you can spend a nice evening or another of the many attractive places that Krakow has to offer. We created this option to satisfy the most demanding of tourists. A personalized tour option where we adapt to your needs. 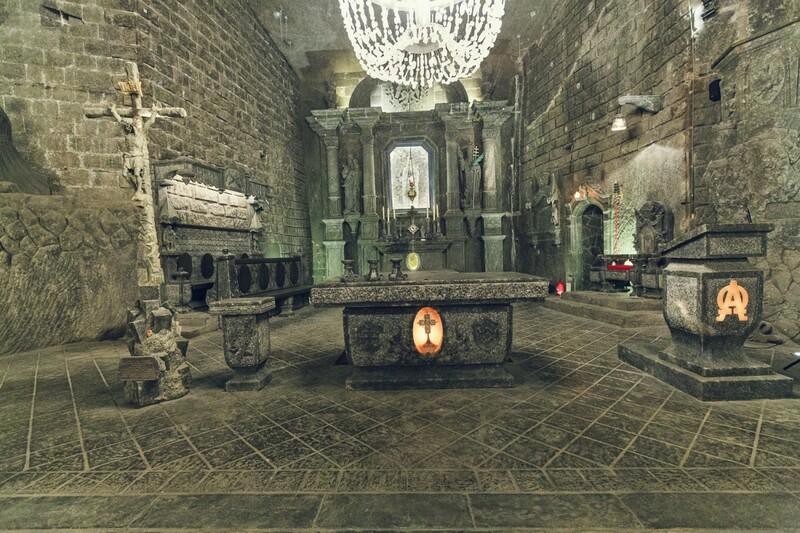 In addition to choosing the start and end times of the trip, a private comfort-class car with a private driver, the undoubted advantage of this version is the possibility of a private guided tour of the Wieliczka Salt Mine. In this case, please make a reservation at least a month in advance. Only then we can guarantee full flexibility due to the ever rising interest in the mine. The maximum size of the bag/backpack that you can bring to the mine is 30cm / 20cm / 10cm. If you have larger luggage with you, you can safely leave it in the car or use the storage room. At the client's request, the company can rent for the duration of the visit a sachet for handy things. Photographing and filming require a special permit which you can purchase at the desk for a 10 PLN fee. The temperature underground varies between 14 and 16 degrees celsius throughout the year. People with disabilities can rent a wheelchair in the museum for free, but they are obliged to have a guardian, who will help them move around the museum. Drivers are not allowed to go down with the group to the museum exhibition grounds. In this case, we propose the Custom Made Tour option where the tour is possible every day around 9:00 am and 5:00 pm in a specially organized tour for people who may have problems overcoming a large number of stairs with a guide in Polish or English (for other languages please ask - it is possible when guides are available). This solution is also available in the Private Tour version.